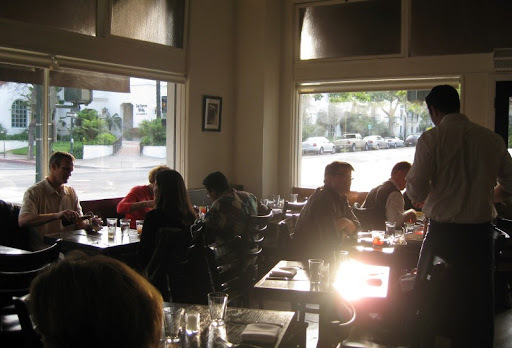 Santa Barbara has always been a difficult food city for us. Admittedly, we generally stay in the touristy State Street area, so this might be like someone visiting San Diego, not leaving the downtown gaslamp district and complaining that they couldn't find any good food. Unlike San Diego, however, Santa Barbara doesn't seem to be big enough to have other, more foodie-friendly neighborhoods. Fortunately, this visit proved much better than usual. A big contributor to that was The Hungry Cat. 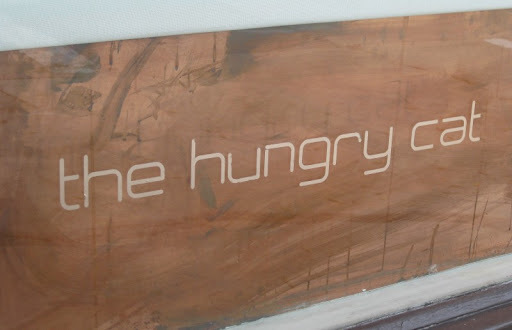 Located just off State Street, The Hungry Cat serves up a small, but appealing seafood-centric menu. It was very tasty - lots of fresh fruit flavor. We loved everything about this dish. 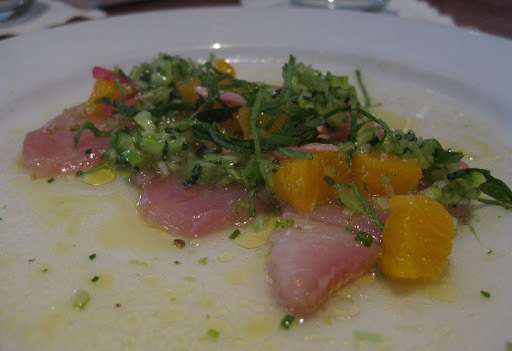 The tuna had a light smokiness and was well seasoned, the mango salad was bright, but only slightly sweet and the cucumber and cilantro water added a nice freshness. Again, everything was just perfect. 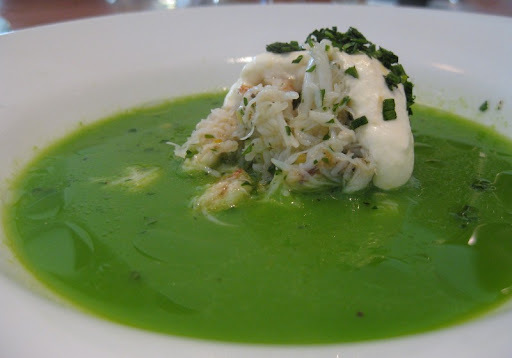 The soup was light an flavorful, the generous portion of crab tasted great and the lemon lemon crème fraîche added a cool richness that matched very well with the crab. 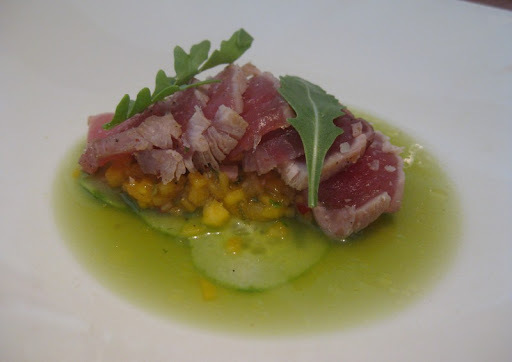 Very nice, delicate flavors with the citrus and celery complimenting each other nicely. A little bit of heat might have been nice - maybe some fresh chile. No complaints, though. We'd been watching this dish being prepared all evening (our bar seats were right across from the grill) and knew we wanted to end with it. While listed as an appetizer, it was an entrée-sized portion. 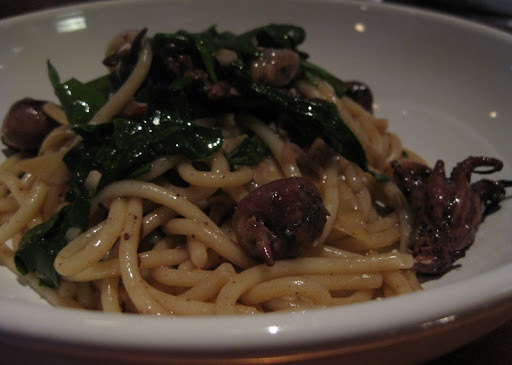 The bucatini was cooked perfectly, the octopus had great flavor and texture, and the bitter greens rounded things out nicely. Along with our food, we had a couple of carafes of white wine. Their selection was interesting and well-priced. All in all, a very enjoyable meal. 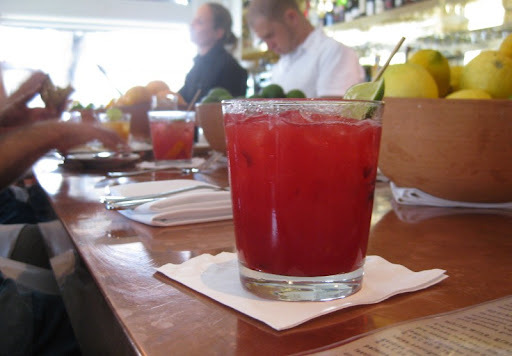 We won't hesitate to come back the next time we are in Santa Barbara.